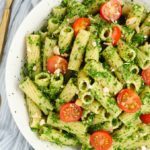 Vegan avocado pesto pasta is a filling twist on classic pesto. Made in less than 15 minutes, this quick recipe is packed with flavor and healthy ingredients. Avocado pesto pasta is creamy, flavorful, and packed with nutrients from spinach and avocado. It’s made just like regular pesto, but with the addition of avocado (and minus the cheese!). Choose your favorite pasta, mix up the avocado pesto, and enjoy an easy meal. 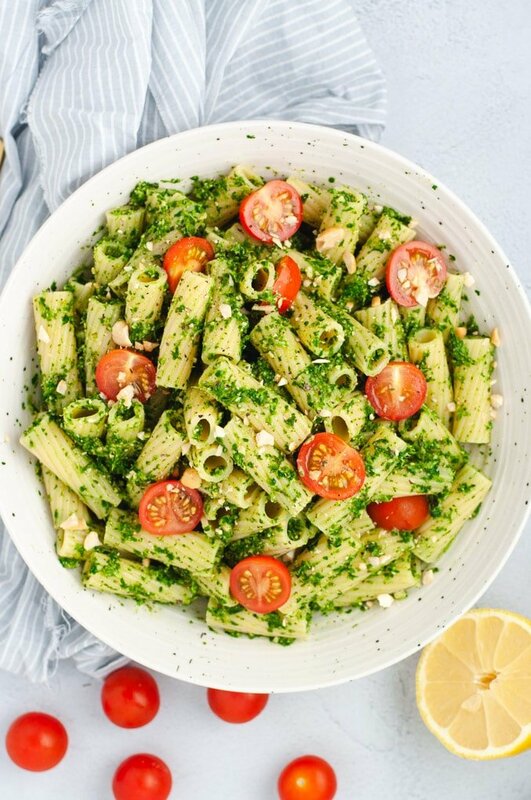 The other secret to this super green pesto? Adding frozen thawed spinach is an easy way to “bulk up” your pesto. Spinach blends in beautifully with pesto and it’s a powerhouse of nutrients. It’s also an inexpensive way to stretch the amount of pesto you have without sacrificing texture or flavor. 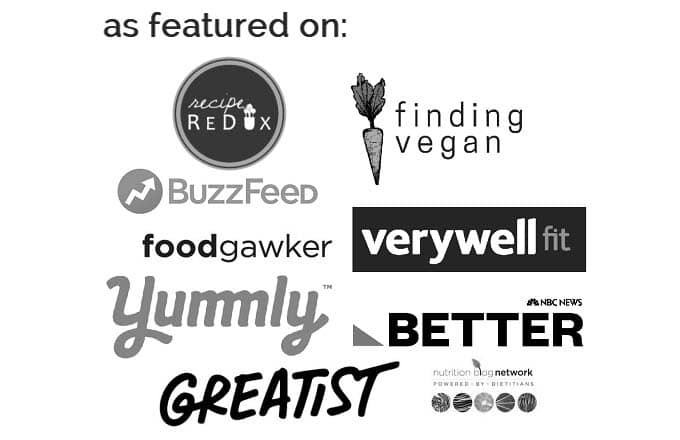 How do you make vegan pesto? 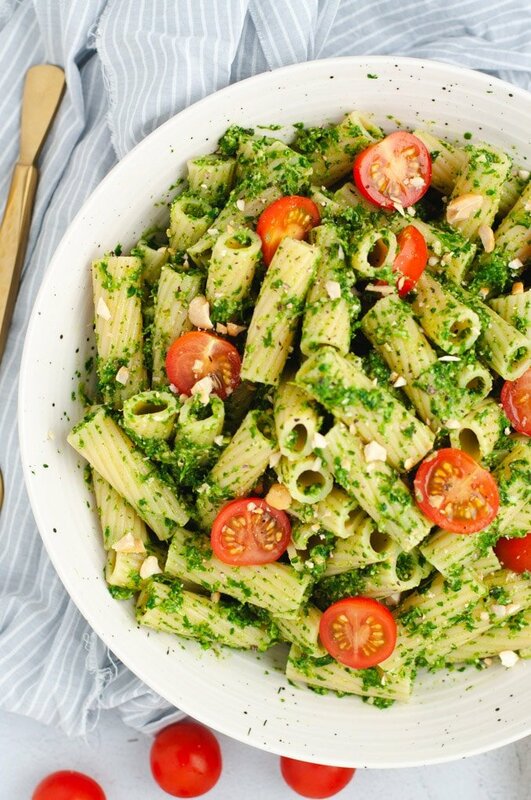 The main difference between regular pesto and vegan pesto is that vegan pesto has no cheese. 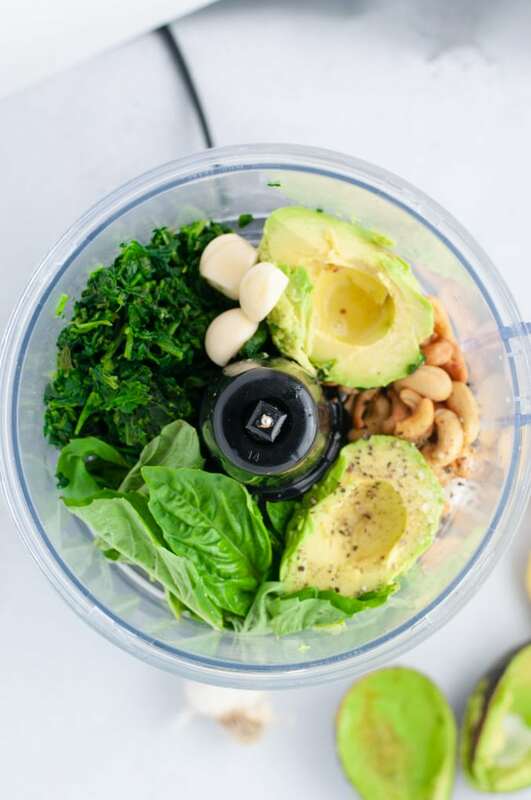 This pesto still has all of the basic ingredients like basil, fresh garlic, nuts (we’ll use cashews instead of the traditional pine nuts), and a bit of olive oil. Making the pesto just requires a blender or food processor. Add to cooked pasta of choice. Serve warm or chilled. 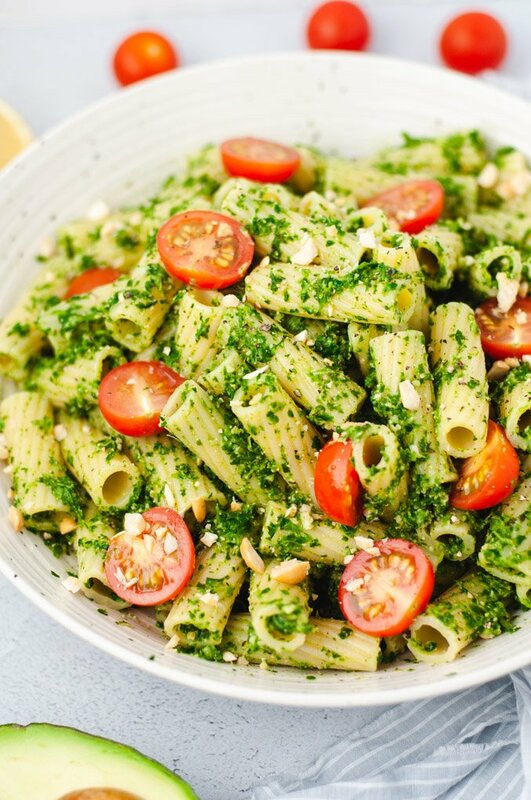 Amp up your vegan pesto by topping with white beans and sliced cherry tomatoes. Looking for a snack? Skip the pasta and enjoy this vegan avocado pesto toast, crackers, or even in this vegan pesto lasagna. 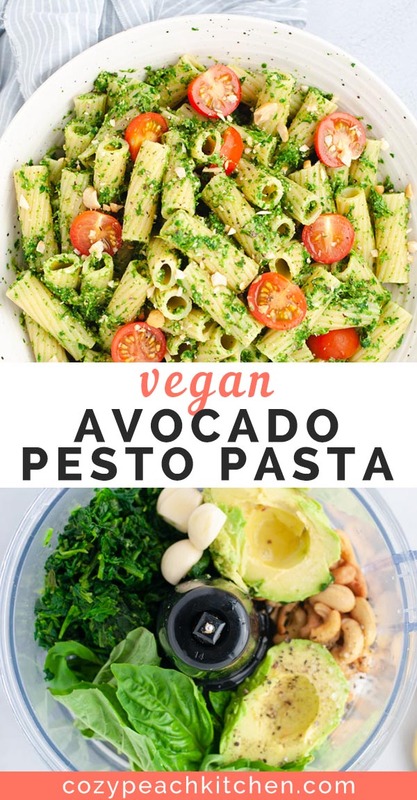 Flavorful vegan pasta made with avocado, spinach, and classic pesto ingredients. Meanwhile, make the pesto. Add all ingredients to a blender or food processor. Blend until smooth and spreadable. Taste for salt and pepper. 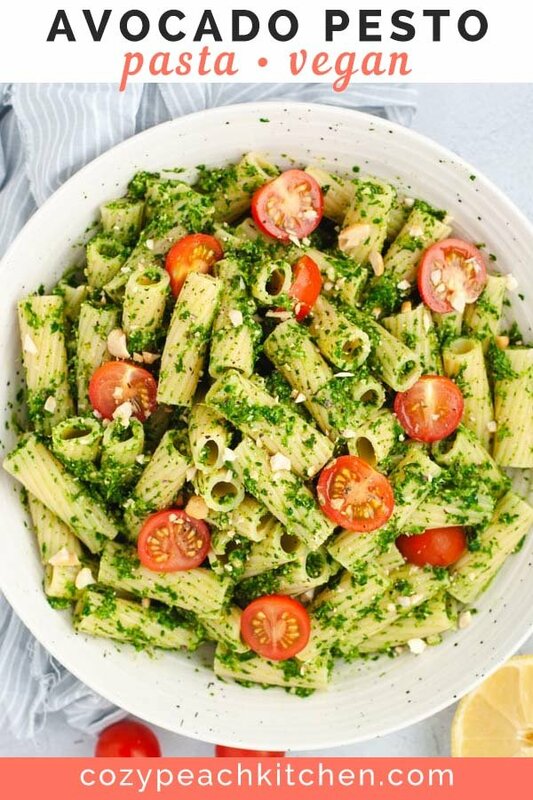 Toss pesto and pasta together. Enjoy topped with fresh cherry tomatoes.